Six Feet Under is the best show ever. Speak Easy is currently in rotation at Jazzy Lounge and recently hit #16 in their top line up. Go check out the station which is broadcast at Live365, great groovy sounds. Zen Conspiracy is the 5th most added album by college radio DJs to the CMJ (College Music Journal) electronica genre! This should mean more rotation and charting next week. "...cerebral and danceable at the same time... You will play it again and again ... one tasty recording....I have to recommend this highly." Samples of the music and places to buy will be listed here soon. For now you may check out Four Keys to Zen directly below for three free tracks from the Zen Conspiracy album, or check out this new video which shows the making of the title track from the new album. It's something of a first draft of the tune which is much more fleshed out on the album itself. However much of the percussion and the complete piano solo is on the full album exactly as you see here. Mashed Buddha releases four tracks online for FREE, three new ones and one from the debut album, check them out here. They represent some of the new concepts I'm exploring for the upcoming full length album Zen Conspiracy, which is a unique dichotomy of more complex beats and simpler big beat dressed up with improvisation as well as layered melodies as is the usual M.O. As promised, the voice of famed guru Uri Geller threatens to put you into a hypnotic coma in the track 'Hype.' I hope you enjoy, and I'll keep you posted about the upcoming full length album which will be released in CD as well as at your favorite online digital music store. "...cerebral and danceable at the same time... You will play it again and again ... one tasty recording....I have to recommend this highly. Buy It Now!" The making of the title cut off Zen Conspiracy. 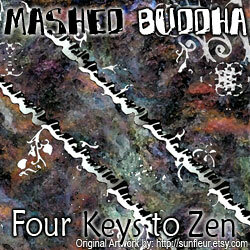 Four Keys to Zen is a 4 Track online EP featuring... 4 new tracks from the upcoming album Zen Conspiracy. Go download them! They're free! And high quality! "Great racing danceable music. They blend right in with all the talented San Francisco DJs I have heard. An instant classic." Also check Street Team if you are interested in helping to spread the word.